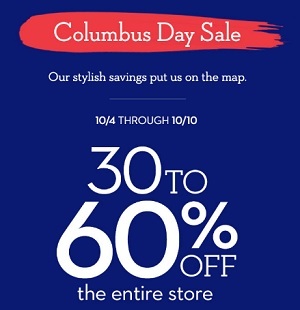 Columbus Day Sale 2016 has already started at U.S. Chico's Outlets. You can enjoy shopping with discounts between 30% and 60% from original retail prices. The offer excludes special savings and extra extraordinary values. Plus, take an extra 40% off already-reduced styles! Source of the information is Chico's. The offer is valid through 10/10/2016. For more information about the offer see your nearest U.S. Chico's Outlet store location.